ADDvantage delivers Ohio FSBO sellers the most comprehensive flat fee MLS programs available. We offer customized flat fee MLS listing plans, each designed to meet the needs of Ohio FSBO home sellers. Our #1 recommended Altru® contract-to-close flat fee listing program takes the worry out of listing as a self-represented flat fee seller and may just get you a higher offer on your home. Read our flat fee MLS-listed seller testimonials and our listing agreements for flat rate MLS sellers and you too will be convinced that we are the most reliable MLS Listing Service in Ohio. GetMoreOffers.com®: professional, reliable, 100% transparent - never any hidden fees or gimmicks. Members of several Ohio MLS boards, GetMoreOffers.com® has been a flat fee listing broker for many years and a real estate broker even longer. Listing Flat Fee MLS in Ohio? Pass your commission savings on to the buyer and get SOLD! Look like all other listings in the OH MLS. Package your Ohio flat fee listing so Realtors® will see your listing in the MLS exactly the same as a full-service agent's listing. List flat fee with Altru® and you'll get more Realtor® showings, worry less about negotiating or filing disclosures, have less stress and likely get a higher sale price. Use a yard sign that promotes a professional image. Realtors® fear For Sale By Owner signs (white and red; generic) because they mean FSBO and not necessarily offering a commission. As well, For Sale By Owner signs promote the seller's phone number and that is not necessarily what a Realtor® wants their buyer to see. The best thing to do is to use a metal GetMoreOffers® sign with our phone number on it. This means you get a professional MLS administrator answering the phone for you Mon-Thu 9AM-7PM, Fri 9AM-5:30PM, Sat 9AM-5PM, Sun 9AM-4PM, and we forward all buyer leads to you directly and schedule appointments. This service is called Agent Assure® and is $159 as an add-on or free with our Altru® program. List with a trusted and reliable OH licensed flat fee MLS broker such as those approved by GetMoreOffers.com. Our flat fee MLS sellers frequently give us praise by saying that we are truly light years ahead of other flat fee MLS and full-service companies in Ohio. And they are right because we have invested in the future and understand what sellers need. We have the longest hours in live phone coverage of any flat fee service in America (Mon-Thu 9AM-7PM, Fri 9AM-5:30PM, Sat 9AM-5PM, Sun 9AM-4PM), we forward all buyer leads to sellers in real time, have the best 100% paperless listing software and have special software to track contract negotiations and close deals without a hitch. 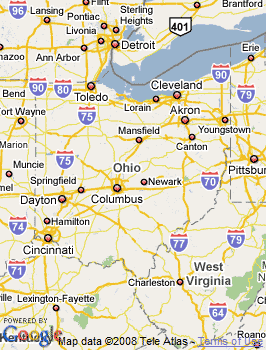 Ohio’s geographic location links the Northeast to the Midwest. With the tenth largest highway network, it is within one day’s drive of 50% of North America’s population and 70% of North America’s manufacturing capacity. Interstate 75 connects the north south regions of the state linking the major cities, Cincinnati, Dayton and Toledo. Interstate 71 links Cincinnati, Columbus, Akron/Canton, and Cleveland. Ohio’s demographics cause many to consider the state as a microcosm of the nation as a whole, but political analysts divide the state into five distinct regions. The northeast including Cleveland, Youngstown, Lorain/Elyria, Akron/Canton votes solidly Democratic due to its traditionally strong unions. The midwest area is largely farmland with a few small manufacturing cites such as Toledo and Lima and leans toward Republican. The heaviest Republican part of the state is the Southwest especially in the suburbs of Dayton and Cincinnati. The southeast area, also known as the Appalachian regions are a swing bloc. The central part of the state consists of Columbus, and its suburbs like Delaware, Pickerington, Urbana and Worthington. It is typical of many newly large cities which means a poor urban Democratic core surrounded by a rich Republican ring.